Niamh McGrath, post mistress Kilbehenny Post Office being presented with a bouquet of flowers by Mary O’Brien, Chairperson, Kilbehenny Community Centre. On Thursday last it was the end of an era in Kilbehenny when the Post Office officially closed. 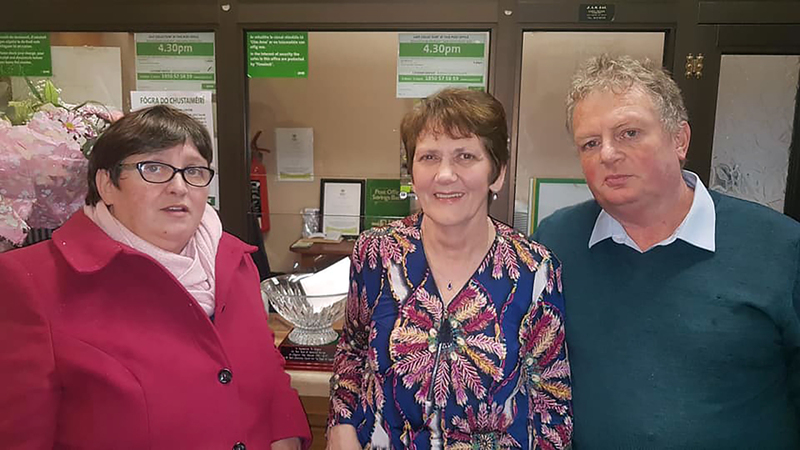 Niamh and Billy McGrath had been running the Post Office for 21 and a half years and friends and neighbours turned out in force to wish the couple well on their retirement. Niamh said herself and Billy were overwhelmed by the amount of good wishes they received and took the opportunity to extend a word of thanks to all the people who were so kind to them on the occasion of their retirement. Elsewhere, in Clogheen, postmistress Margaret Moroney also retired, closing the Clogheen Post Office doors on January 31. Cllr Marie Murphy and PJ English pictured with Margaret Moroney on her last day as Post Mistress in Clogheen. Ably assisted by her husband JJ, Margaret was considered the ultimate professional by locals who turned out in large numbers to wish her well on her retirement.